Oil and gas exploration in Ohio can be traced back to 1814, when Silas Thorla and Robert McKee drilled a well in search of salt brine in Noble County. Along with finding salt, Thorla and McKee accidentally discovered oil and natural gas (Noble County Department of Tourism, 2004). In 1943 an article published by E. Willard Miller in The Ohio Journal of Science noted, "Next to Pennsylvania, southeastern Ohio is the oldest oil producing region in the United States. However, never in its history has it been a large producer, and for the past forty years production has been gradually declining" (Miller, 1943). Nonetheless, nearly 70 years later a more sophisticated understanding of Ohio's geology and significant technological advancements in well drilling processes have positioned Ohio as a major producer of oil and gas. A 2011 report by the Ohio Department of Natural Resources (ODNR) estimates that recovering just 1.2% of Ohio's Utica shale hydrocarbons would result in nearly 3.75 trillion cubic feet of natural gas and 1.31 billion barrels of oil (Ohio Department of Natural Resources Division of Geological Survey, 2011). These ODNR estimates were made with the assumption that the Utica shale play in Ohio holds one-third of its volume in natural gas and two-thirds of its volume in crude oil. However, it should be noted that ODNR projections are not based on actual Utica shale production data and therefore should be considered as an educated guess based on reserve calculations. Yet, if these estimates hold true, Ohio could clearly become a major oil-producing state. This fact sheet provides a summary of the resurgence in Ohio's oil and gas industry in the Marcellus and Utica shale regions. The document provides a general overview of modern-day drilling processes, Ohio's shale geology, shale gas opportunities, shale gas challenges, and Ohio State University Extension's role in educating Ohio's landowners and communities. The recent convergence of two long-practiced drilling techniques, hydraulic fracturing and directional horizontal drilling, has transformed the oil and gas industry. Horizontal hydraulic fracturing is a process that enables oil and gas companies to access unconventional natural gas formations that were not economically feasible to recover previously. Hydraulic fracturing is the process of applying high-pressure hydraulic force into an oil and gas well to fracture the underground shale rock formations. The pressure is applied using a mixture consisting of approximately 98 percent sand and water, along with small portions of chemical additives. 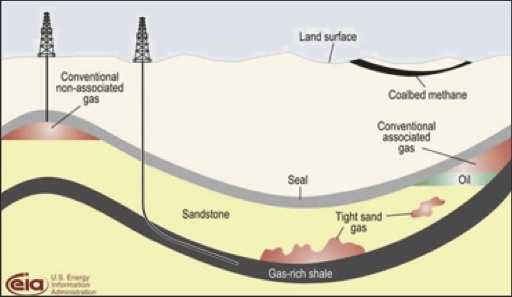 The sand serves as a propping agent, which holds the fractured shale rock open allowing natural gas and oil to flow up the well. Directional horizontal drilling dates back to 1891, when the first patent was granted to place a horizontal hole from a vertical well. Horizontal drilling is the same as vertical drilling until the "kickoff point" located just above the target oil or gas reservoir. Once the kickoff point has been reached, the drill head deviates from a vertical direction to proceed in a horizontal orientation (The Pennsylvania State University, 2011). Image A illustrates the difference between a typical vertical and horizontal well. The potential for large natural gas reserves in the Marcellus and Utica shale has revitalized Ohio's oil and gas industry. Deposits in these formations are positioned between 7,000 and 12,000 feet below the surface. While the primary location of the Marcellus Shale play is in New York, Pennsylvania, and West Virginia, the western edge is situated in eastern Ohio. The Marcellus shale formation ranges in thickness from 50 feet to 200 feet and consists primarily of dry gas. The Utica shale extends across most of Ohio and ranges in thickness from 87 feet to 350 feet. In addition to dry gas, early drilling data indicates much of Ohio's Utica shale may also contain oil and wet gas. If these projections are correct, the Ohio Utica shale could yield a significant percentage of oil and natural gas liquids (NGLs) such as propane, butane, ethane, and natural gasoline (Ohio Department of Natural Resources Division of Geological Survey, 2012). Image B provides an aerial outline indicating the location of the Marcellus and Utica shale in Ohio. Oil and gas development in the Marcellus and Utica shale stimulates community tax revenue, wealth for leaseholders, potential for job creation, and the retention and expansion of existing businesses. In addition, natural gas promotes the diversification of Ohio's utility electric generation, as it is cleaner than coal and currently less expensive. Low natural gas prices provide evidence that natural gas is highly efficient for producing electricity (Weinstein and Partridge, 2011). The natural gas boom has the potential for significant benefits, enhancing economic growth throughout the state. However, it should also be noted that economists have a long history of examining energy economies and the boom-bust cycle associated with the rise and fall of energy prices. The most important element in avoiding the bust is having a highly diversified economy, which is still possible for Ohio to achieve (Weinstein and Partridge, 2011). Community leaders should establish a strategic plan to ensure that the energy boom gains of today are leveraged as building blocks to promote diversified economic growth for years to come. While shale gas offers economic benefits, possible costs associated with the increased drilling should also be recognized. One of the primary environmental concerns with natural gas production is the effect on air and water quality. Additionally, an increase in truck traffic during drilling creates road maintenance and road safety concerns for local governments and residents. Rural communities affected by the energy boom experience a significant inflow of people to support shale gas development. As a result, local leaders should consider social impacts such as the stress on local school systems, health care systems, housing, and emergency management services. The development and delivery of this research-based information on shale energy exploration and drilling in Ohio is supported by OSU Extension and faculty from other OSU departments, as well as expertise from the Ohio Department of Natural Resources and the Ohio Farm Bureau. A number of factors ultimately impact the economic viability of shale gas production. The improved drilling technologies have contributed considerably to the economic potential of shale gas formations throughout the United States. However, the potential for adverse environmental effects of hydraulic fracturing and shale gas development has become a cause of controversy. Working with industry, government officials, and local leaders, OSU is committed to communicating the best scientific information to help the state prepare for this emerging energy boom. Noble County Department of Tourism. "Welcome to Noble County, Ohio: Gateway to Appalachia." Last modified 2004. http://www.noblecountyohio.com/thorlamckeewell.html (no longer available online). Ohio Department of Natural Resources Division of Geological Survey. "Marcellus and Utica Shales Data." Last modified March 16, 2012. Accessed May 11, 2012, geosurvey.ohiodnr.gov/energy-resources/marcellus-utica-shales. Ohio Department of Natural Resources Division of Geological Survey. "The Marcellus and Utica Shale Plays in Ohio." Last modified March 11, 2011. Accessed Dec. 7, 2015, geosurvey.ohiodnr.gov/portals/geosurvey/energy/Marcellus_Utica_presentation_OOGAL.pdf. The Pennsylvania State University. Economic Comparison of Multi‐Lateral Drilling over Horizontal Drilling for Marcellus Shale Field Development. Last modified January 5, 2011. Accessed May 10, 2012, ems.psu.edu/~elsworth/courses/egee580/2011/Final%20Reports/fishbone_report.pdf. Weinstein, A. L. and Mark D. Partridge. The Economic Value of Shale Natural Gas in Ohio. Columbus, OH: The Ohio State University College of Food, Agriculture, and Environmental Sciences Department of Agricultural, Environmental and Development Economics, December 2011.